We spent the day on the road returning from Florida. Arriving back home in suburban Atlanta around 8:00 pm, the National Weather Service was reporting the local temp as 100 degrees. 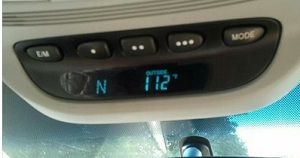 Around 6:00 pm near Milledgeville, the external thermometer in our car showed 112. It tends to read high, but we can't recall a time it was off my more than three degrees. I hope there's enough electricity around to keep everyone's A/C going. But it's days like today that make me wonder how well we'll fare after all those coal plants targeted by the EPA are shut down. How much more likely will blackouts and brownouts be on days with temps like today's come 2016 or 2017? Daniel Webster said it well in arguments before the U.S. Supreme Court: "An unlimited power to tax involves, necessarily, a power to destroy." Justice Roberts seems to believe Congress has the power to tax whatever it wishes, or tax those who don't do as Congress wishes. Under Roberts new rules, Congress doesn't even have to call it a tax. There's plenty of destructive power in Roberts' ruling. But like Obamacare itself, we'll probably have to wait until implementation for most Americans to realize how destructive it really is. Have ATF whistleblowers been put in harm's way? WASHINGTON –Senator Chuck Grassley and Chairman Darrell Issa today asked the Inspector General for the Department of Justice to immediately investigate whether steps have been taken to prevent retaliation against whistleblowers in the Fast and Furious case by senior management of the Bureau of Alcohol, Tobacco, Firearms and Explosives (ATF) in light of inflammatory comments by ATF personnel reported to the lawmakers’ offices. In a letter sent this afternoon to Michael E. Horowitz, Grassley and Issa detailed hostile and extremely negative comments that were made last year about two of the main whistleblowers who testified before Congress, according to a direct eyewitness account. Grassley and Issa said they have just learned that the two whistleblowers have been placed under the supervision of the ATF official who reportedly made the comments, Scot Thomasson. Grassley and Issa said the fact that these alleged comments have been in public documents since May, and since the Inspector General should be “a firm, independent voice within the Department to protect whistleblowers from retaliation,” they’re asking the Inspector General to investigate how the ATF official has been admonished, how the ATF official was elevated and given such supervisory duties, and what steps are being taken to protect the whistleblowers from the campaign of retaliation the ATF official expressed a desire to conduct in his comments. Click here to read the letter of request from Grassley and Issa. You've got to know Holder and the gang at DOJ can't be happy about what happened in Congress yesterday. A quick accounting trick was worked into the just passed Transportation Bill in the House and Senate that's going to make troubled pension plans look less troubled. In reality, underfunded pensions will still be underfunded. But companies will now be allowed to base future projections using average interest rates over the past 25 years, not just today's cold hard realities. Remember 25 years ago? I recall having CDs that paid around seven or eight percent, EE U.S. Savings bonds paying at least six percent if not around seven. According the St. Louis Fed, there were times in 1989 when the prime lending interest rate was over 10 percent. Using these long-gone interest rates to skew today's pension projections seems more than a tad dishonest. But Democrats and Republicans on Capitol Hill seem to think it's gonna make today's pension troubles go away. Or at least keep them out of sight for a while longer. The more I think about it, the more the decision on Obamacare bothers me. Under the mandate, if an individual does not maintain health insurance, the only consequence is that he must make an additional payment to the IRS when he pays his taxes. See §5000A(b). That, according to the Government,means the mandate can be regarded as establishing acondition—not owning health insurance—that triggers a tax—the required payment to the IRS. Under that theory, the mandate is not a legal command to buy insurance. Rather, it makes going without insurance just another thing the Government taxes, like buying gasoline or earning income. And if the mandate is in effect just a tax hike on certain taxpayers who do not have health insurance, it may be within Congress’s constitutional power to tax. The court, rather than remand the flawed legislation back to Congress for a rewrite to fall within what the court deems constitutional bounds, has instead created a theory to bypass the legislative branch to allow the law to stand. Rather than overturning what the court deems a constitutionally flawed penalty, the court has chose to stretch its scope of power and made an excuse for the law to stand. Under the new Roberts' rules of taxation, Congress now has authority to lie. It can pass any tax it wants but thanks to the Roberts' decision, Congress seemingly has a green light to go to great lengths to deceive the American people and insist a tax is not a tax. And then turn around and enforce collection of the falsely labeled tax as a tax. Thanks to the supposed conservative Justice Roberts, we the people now have more reason than ever to distrust the government. We now know we have a Supreme Court willing to whip up a legal theory to excuse Congressional deception rather than force the Congress to be honest with those it was elected to represent. The House of Representatives votes to hold Attorney General Eric Holder in contempt of Congress. Seventeen Democrats voted with the Republican majority. Right on cue, Republican leaders like John Boehner and Eric Cantor say they'll move quickly to pass Obamacare repeal legislation in the House. They also know the move means nothing unless they have the Senate willing to do the same. And the Senate remains under Democrat control in lockstep with the president on health care. The House alone could stop Obamacare. It could cut funding, but it won't go that route. Republican leaders like to talk a tough game. But they prefer status quo results to taking tough actions. Plenty of coverage to today's ruling elsewhere. I won't try to replicate. The president and the Democrats in Congress now own Obamacare as a tax. More premium hikes are coming down the road in 2014. Democrats are counting on dumbed-down Americans not to look that far down the road. Now that Obamacare is ruled constitutional, how quickly will employers begin trimming their work force to negate the coming impact of higher Obamacare-mandated health care costs? I know serveral people who were either laid off or took demotions shortly after Obamacare passed the Congress in 2010. Principled states apparently still have room to resist the Obamacare Medicaid provisions. Depending on how this is played, will it be enough to make the larger application of the law unworkable? If you've ever wondered what progressives like Chris Matthews, Rachael Maddow or Barack Obama are really saying, there's a little guide of definitions posted at Zero Hedge that should help clear things up. Even the Chamber of Commerce can no longer ignore the signs. And while business boosters admit things aren't going well, I've seen plenty of empty storefronts and other signs along suburban streets that make me think things are even worse than they're letting on. Thursday's the day. We'll get a good indicator whether the Republicans have any intention of slowing Barack Obama's march of fundamentally changing America when the House votes on whether to hold Attorney General Eric Holder in contempt of Congress. The NRA is exercising some of its political clout in encouraging members of the House of Representatives to vote to hold Attorney General in contempt for failing to release Fast and Furious documents to congressional investigators. NBC News is among those reporting Democratic House leadership is working on damage control. Even without the NRA getting involved, I'd like to believe there are at least some Democrats who want to get full disclosure over the Fast and Furious fiasco. People have died as a result of what happened. Let's get to the bottom of it. Was out driving yesterday when some rough weather hit. I figured it was as good a time any any to pull off the road and fill up with gas. But when I swiped my credit card at the pump, I got the dreaded "see attendant" prompt. Tried a second card. Same prompt. The rain had let up, so I walked in. Heavy rain or possibly lightning has knocked out their link to credit card processors. The store would only be taking cash for an indefinite period. How many people today run their tanks down to "E" with only an ATM or credit cards in their wallets? We have too much confidence services we take for granted will always be there. It mever hurts to have a least a couple of twenties within reach as a back up. I don't go bonkers over every military exercise staged around U.S. cities. These exercises have been going on for decates. I had a chance to witness one in Atlanta in the early 1990s that simulated an urban hostage rescue, under the premise the Marines involved would sharped skills that someday might be needed to carry out a overseas embassy extraction. But the increasing frequency of these exercises, along with scope and scale, may be crossing even my threshold for concern. Case in point: St. Louis. Gateway Pundit and Zero Hedge have each noted the operation underway there. Scariest part of the whole operation? According to a local TV report, people there are welcoming troops in the streets because it might cut down on crime. Crime fighting and domestic civilian suppression are not roles for the U.S. military. Those who welcome even the appearance of it do not understand what they are inviting. Our founding fathers would have had fits is they saw standing armies routinely rolling through our communities. In fact, many of the founders resisted the idea of a standing army for defense because it might be used to suppress the liberties of U.S. citizens. Be careful what you welcome under the guise of more security. A report says some big European countries want to push an economic growth plan at summit next week. This just sounds like more lend, extend, pretend. Growth is nice. And it's a key to economic recovery under normal circumstances. But first, you need a firm foundation. Europe today is more like shifting sand. With some parts bearing more resemblance to quicksand. No one is emphasizing a strong foundation. The political forces seemingly pour all their efforts into keeping the illusion of one alive. Craziness heats up. Wanna talk about it? Surreal stuff happening. President Obama used to say he was unaware of Fast and Furious. Now he claims executive privilege to keep what his crew knew a secret from Congress. Europe still totters on the brink. And a county out west ponders the idea of using eminent domain to seize underwater mortgages and force terms to be rewritten. 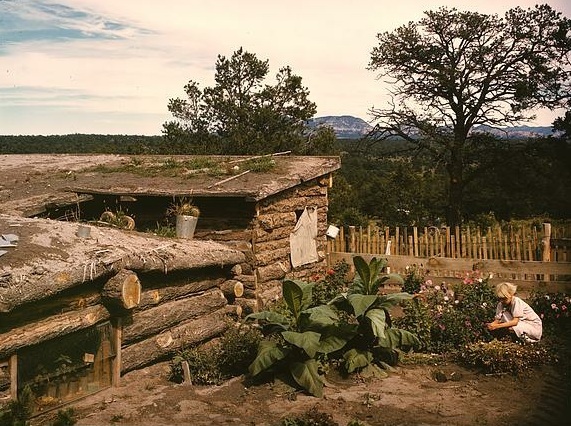 We may even talk summer gardening and take a look at some good, easy to grow veggies that help cut the cost of grocery shopping when you grow 'em at home. Drop by for Don and Doug. On Friday (June 22nd) this week. Same time. 1:00pm EDT on TalkSouthRadio.com. Have something on your mind? Join the conversation at 678-344-9926. "How can the President invoke a privilege to protect documents he and the White House are supposed to have had nothing to do with?" In 2007, then-Senator Barack Obama told CNN's Larry King that Executive Privilege was not a good reason to with hold information from Congress. Obama once use the bigness of government as an excuse for not knowing about Fast and Furious. Now Obama uses executive privilege to keep Congress and the country ignorant of who in his administration knew what when. How many options can you pile on a pizza? And how many disclosures about all the possible combinations will the FDA require? Emily Miller has more at the Washington Times. Even setting aside the discrepancy between official and outside estimates of civilian deaths, our analysis shows that the administration’s own figures quoted over the years raise questions about their credibility. In addition to the article, ProPublica published an interactive graphic contrasting various claims regarding civilian casualties from drone strikes. 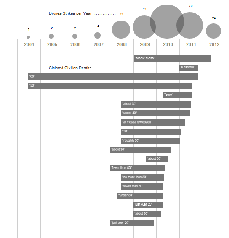 Informational pop-up windows are included when you view the chart at ProPublica's site. When it comes to Europe, the guys at Weiss Research say nothing's been fixed. And the public is starting to see through the double talk games of what's been attempted. I came across a fascinating set of photos in the on-line collection at the Library of Congress. I've posted before how much Americans lives have changed in the last 70 years or so, but this bunch of pictures and their captions were a real eye opener. 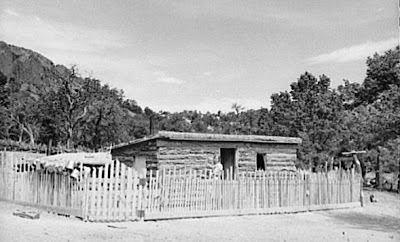 These photos were shot in Pie Town, New Mexico in 1940 featuring Jack Whinery, his wife, their children and their home. To consider them resourceful and self-reliant would be a huge understatement. Garden adjacent to the dugout home. ten days to build. Two small sleeping rooms were added later. buy anything that they can make at home." 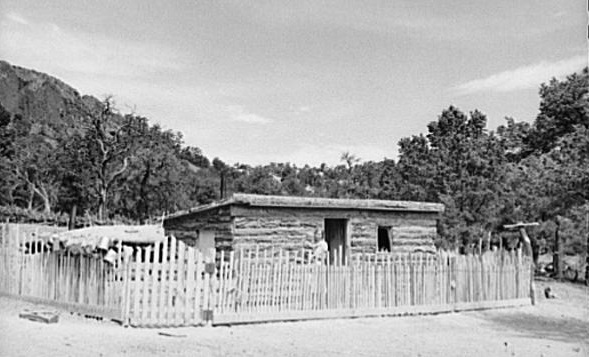 All photos in the series were shot under the auspices of the U.S. Government Farm Security Administration. 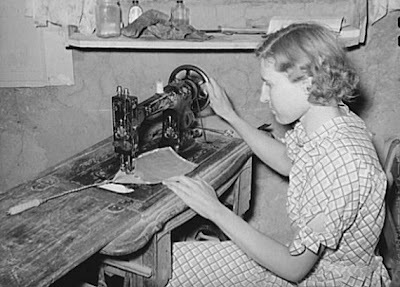 More than 20 other shots documenting the Whinery family, their resourcefulness and hard work can be found in the Library of Congress collection. They're part of a larger collection shot in the homestead community of Pie Town in 1939 and 1940. 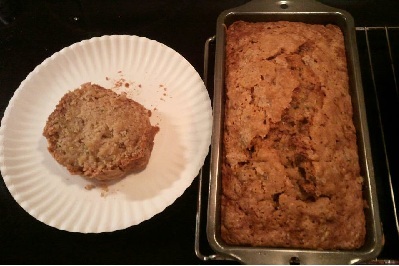 We're indulging in some warm zucchini bread tonight after picking some giants out of the garden earlier today. One of 'em was 14 inches long. Is it paranoia or something else? There appears to be a heaping helping of moonbattery and exaggeration in the following article, but does it hold an element or two of truth? The writer does seem to make the point that the U.S. government appears to be acting with increasing frequency as it makes ever wider grasps for domestic security and control. But is paranoia the root cause, or does government only want us to think it acts out of concern posed by threats foreign or domestic as it seeks excuses to reach ever deeper into our private lives? If we're a nation ruled by laws, why are so many giving the president a free pass with stuff like this? If one individual can decide to exempt nearly a million residents from the law — when he most certainly could not get the law amended or repealed through proper legislative or judicial action — then what can he not do? Obama is turning out to be the most subversive chief executive in terms of eroding U.S. law since Richard Nixon. Dangerous precedents are set when a president and his core constituencies begin to think and act like they're above the laws of the land. Where will they take things if given another four years to run wild? While browsing for stories on Jesse Jackson's purported national series of gun shop protests, I did find something else. Pro-gun open-carry activists strapped on firearms and held a demonstration of their own last week in Birmingham, Michigan. The Detroit News covered it. And today, the Tulsa World used the Birmingham event as a springboard to assess larger open-carry issues. Oklahoma becomes an open carry state effective November 1st. A few weeks back, Jesse Jackson promised Saturday, June 16, would be a day of protest at gun stores across America. As of Sunday morning, I find only sparse coverage. There was the lead event near Chicago, where Jackson's Rainbow PUSH Coalition bused in protesters. And there was a protest near Detroit that drew about a dozen participants. There were supposed to be 20 to 25 of these actions across the country. Where were they? I don't see coverage of any others on the web. Can we officially rank Jackson's push a fizzle? But a bank 'jog' is said to be underway in parts of Europe. CBS News tonight was anchored from London. I missed the top of the 'cast, but by five minutes in, the focus was devoted to Europe, the Euro and Greece. If the American MSM is moving toward 'crisis mode' coverage... what's in store in the weeks ahead? On the other hand, with Katie Couric gone, CBS seems to be the one of the former Big 3 that seems to cling to any sort of editorial objectivity. NBC and ABC seem to direct their casts more toward creating favor with the White House rather than informing the U.S. population. Here in Atlanta, ABC's World News airs at 7:00 pm so I clicked over to watch. Diane Sawyer rang out right on cue. ABC led with the brave move by President Obama to protect undocumented aliens who've grown up in America. Story 2 on Sawyer's rundown: Mr. Obama pushes back against a heckler in the Rose Garden. Story 3: Thanks to President Obama, a graduating high school student from Miami will go to college next fall on her way to becoming a heart surgeon. Greece and Europe then rated 20 to 30 seconds of a brief script read by Sawyer. During that half minute, she covered the U.S. stock market as well. Then Sawyer moved on to a wildfire story followed by a feature about a guy who planned to walk a high-wire across Niagara Falls tonight. After the wire-walker segment, Sawyer expressed relief the high-wire guy would wear a safety harness. And she mentioned ABC would air his attempt live later in prime time. By then, I'd had enough. I moved on to other things. Tongue in cheek, but is it far from the truth? Charles Hugh Smith walks through the phone menu on the Federal Reserve's secret line. European Parliament member Daniel Hannan sums up the Spanish bailout plan as a plot to stick more people with more debt while fixing nothing. You need an ID for an Obama rally. Democrats also require proper ID to attend their state conventions, and to gain admittance to government office buildings. You also need an ID to buy alcohol, cigarettes, medicine or even spray paint in many localities. Why do Democrats insist ID is essential to engage in everyday business, government or consumer transactions, but insist requiring ID to vote means people will be disenfranchised? I'm not talking about national holidays when banks take a day off work with the rest of us. Bank holidays are something completely different. It's when banks are closed, often unexpectedly, to let government and management deal with a financial crisis. Bank holidays happened in the 1930s, but lifestyles were different then. Grandma and Grandpa usually had cash under the mattress or in a cookie jar. Credit cards didn't exist. Have you ever pondered what a bank holiday might look like our largely cashless age of credit cards and automatic on-line payments? SurivivalBlog.com offers some points for your consideration. And the darn drone wasn't even airborne. Fox News reports it was being hauled on the back of a flatbed trailer. Photos have been popping up on Twitter. Here's a sample. The site was similar to one reported last December in Cowley County, Kansas. KSNW TV reported that sighting with photos and eyewitness accounts. An election boycott call, Greeks go prepper, and more! Former ag commodities broker Ann Barnhardt is now among those talking a boycott of November's presidential election. Even if Romney's no better than O, wouldn't it make sense to at least cut the momentum of Obama's revolutionary push? As of Wednesday, Greeks have reportedly pulled the equivalent of a billion dollars out of their banks. Reports indicate a chunk of that cash is going for canned goods and pasta. How bad do they think things will get? And for how long? And how come only a few people seem to be talking about what appears to be another leg down in real estate values? And hardly anyone's talking about the ever-rising federal deficit. These and more topics make the list for Thursday, June 14's Don and Doug show on TalkSouthRadio.com. We start at 1:00 pm EDT and take live callers at 678-344-9926. We also interact on Twitter @TalkSouthRadio. Not a weather related storm. People in Greece are on watch for a political and economic one. One that could be bigger than those that have triggered past bouts of protest and unrest. Reuters reports Greeks are hitting their banks hard, withdrawing the equivalent of a billion dollars from accounts. Apparently a bunch of the money is going to buy canned goods and other non-perishable foods ahead of Sunday's election. Running around gathering supplies at the last minute when potential disaster is on the horizon is called prepare on warning. And it can be a fool's game. There's a bunch of folks who'd rather have enough basics already on hand so they can skip the crowds and the fighting over scraps. It's much easier to implement a personal plan already in place than try to create one as things begin go haywire. Those who scorn preparedness as a lifestyle may soon get some inspiration to alter their opinions. Nigel Farage says the Spanish bailout makes things worse, not better, in Europe. "This ship, the Euro Titanic, has now hit the iceberg and sadly, there simply aren't enough life boats," according to Farage, who is a member of European Parliament representing South East England. His comments came in Strasbourg earlier today (13 June 2012). Farage makes the point well. For a couple years now, one fix after another has been touted for the disintegrating economies in Europe. But none of it has worked. Deterioration has only become deeper and spreak wider. I expect even crazier days lie ahead. The scary part isn't the questions. The scary part comes at the end when you get to see how many people didn't know the answers to the questions. In a blunt assessment, investigators said Customs and Border Protection's Office of Air and Marine has a fleet of nine “unmanned aircraft systems” and is awaiting a 10th — though it doesn’t have enough ground support and doesn’t have a good plan for prioritizing missions. The report says Customs and Border Protection added its eight and ninth drones last year, and expects to add a tenth sometime this year. When CPB had seven drones, it reported they were based at Libby Army Airfield in Arizona, Grand Forks Air Force Base in North Dakota, Cape Canaveral Air Force Station in Florida and Naval Air Station Corpus Christi in Texas. It's posted by Robert Smith over at NPR's PlanetMoney. Check it out. Meanwhile, I can probably make it even more simple that Smith does. What's going on now is just another round of lend, extend, pretend. Lend more money to an unsustainable economy. Extend the time until that economy crashes or collapses from its own unsustainability. Pretend that the lend and extend efforts will fix what's broken. Senator Chuck Grassley, Ranking Member on the Senate Committee on the Judiciary, issued the comment below about the announcement by House Oversight and Government Reform Committee Chairman Darrell Issa that the House committee will vote next week on whether to hold Attorney General Eric Holder in contempt of Congress for failing to turn over documents subpoenaed in October 2011 regarding the government’s Fast and Furious operation. The House investigation stemmed from Senator Grassley’s inquiry into whistleblower allegations that the government had allowed the transfer of illegally purchased weapons found at the scene of the murder of U.S. Border Patrol Agent Brian Terry. The Department of Justice denied the allegations to Senator Grassley for 10 months before being forced to withdraw its denial in face of evidence to the contrary. “This action is straightforward and necessary. Contempt is the only tool Congress has to enforce a subpoena. The Department of Justice can avoid the action by complying with its legal obligation. It’s not about personalities. It’s a procedural mechanism in our system of checks and balances. If Congress is afraid to pursue answers to questions, it’s not doing its job. People deserve transparency from their government. Transparency leads to the truth about what’s going on. It puts people in a position to defend their rights. It protects our freedoms. I count 29 closures so far this year on the FDIC list. Four of them happened last Friday. We need to accelerate job creation in the private sector. One of the ways that we can do that is putting teachers and fire fighters and police back to work because those are good middle class jobs. The pitch is for Congress to pass federal legislation to cover the gaps in local funding to allow retention or rehiring of local government employees. But it would be a stop-gap measure at best. Obama didn't say what's caused those layoffs of police, firefighters and teachers. Neither did Axelrod. Nor have any of the pundits I've heard harping over their comments. Local government jobs are being cut because wealth vanished when real estate values declined. Public payrolls were cut largely because property tax revenues dropped. In some communities, property tax digests have collapsed. And there's no sign real estate values or property tax collections are going to bounce back any time soon. If you pass federal bailouts to keep local public employees on the job, you're going to have to pass another, and then another. It's best if local governments learn to live with what their communities can afford, and create realistic spending plans based on local economies. Yes, it's painful. But the sooner they begin holding expenditures within anticipated local revenues, the sooner they set a new baseline for normal. Having a deeply indebted federal government pretend to cover these costs only creates the illusion of fix. It fails to put us back on a sustainable path. It's just more of what we call extend and pretend. In 2008, Obama seemed to promise brighter days with Hope and Change. Now, in a recorded message, he tells progressive bloggers at NetRoots that change is hard. How much more change Obama style change can the country take? How much more hardship will we have to endure? A New Jersey utility is trying to convince customers President Obama doesn't have a special account set up to pay their power bills. No word on how many people may have fallen for the scam and shared their Social Security numbers or other personal information hoping to get a piece of the action from a non-existent program. NEWARK, N.J., June 6, 2012 /PRNewswire/ -- PSE&G is telling its customers that they should not fall for the latest urban myth which claims that President Obama is directly paying their utility bills. The state's largest utility is reporting that customers are being duped into believing that their bills can be paid electronically using a Federal Reserve bank routing number. The myth, which has been spreading person to person via phone, Twitter and texting, started as a nationwide phony bill payment program that promised to credit or pay utility bills in exchange for personal information, including social security numbers. Customers are being led to believe that their utility bills will be paid on their behalf if they use a Federal Reserve bank routing number. While use of the routing number when making an online payment appears to result in a zero bill balance, the funds are not available from the federal government and the attempted payment will fail similar to a returned check. PSE&G is telling its customers that this is a scam, there are no payments being applied to their accounts, and their PSE&G account balances remain due. If you follow TV financial pundits or chuckle at brokerage ads, you'll really enjoy this one. But while it made me laugh, it contained enough truth to give me a chill as well. (Best watched in full-screen with your cursor off the screen to see all the captions). "Washington needs a straight shooter"
Seen this conservative's campaign ad outta Arizona? I'm not closely following Arizona's 4th District race, so this post isn't an endorsement. But if you want to know more on Ron Gould and his congressional campaign, go to his website. He has been endorsed by FreedomWorks. The National Shooting Sports Foundation, the trade association for the firearms and ammunition industry, will file to intervene in the frivolous lawsuit brought today by the Center for Biological Diversity and six other groups to pressure the Environmental Protection Agency to ban traditional ammunition containing lead components. Reuters reports the suit was filed in U.S District Court in Washington DC and seeks to push the EPA into rule-making against lead based ammunition under the Toxic Substances Control Act. The Center for Biological Diversity's press release on the lawsuit is available here. 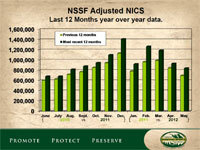 The May 2012 NSSF-adjusted National Instant Criminal Background Check System (NICS) figure of 840,412 is an increase of 20.6 percent over the NSSF-adjusted NICS figure of 696,947 in May 2011. For comparison, the unadjusted May 2012 NICS figure of 1,305,392 reflects a 7.0 percentincrease from the unadjusted NICS figure of 1,219,872 in May 2011. This marks the 24th straight month that NSSF-adjusted NICS figures have increased when compared to the same period the previous year. “All I can tell you is when I look into the eyes of the leaders of Europe, and as a leader of a group in the European Parliament I do get eyeball to eyeball with them, when I look into the eyes of these people, frankly what I’m seeing now is madness, absolute, total and utter madness." The complete interview with Farage is available at King World News. Do you still think Europe's quagmire is going to end well? My favorite line in the post? "THE U.S. GOVERNMENT STORES ITS GOLD WITH THE MILITARY, NOT THE BANKS"
Bit by bit, Occupy's first generation is succumbing to an insidious institutionalization and ossification that could be fatal to our young spiritual insurrection unless we leap over it right now. Putting our movement back on track will take nothing short of a revolution within Occupy. For all it's promises of launching a massive American Spring offensive against capitalism, it appears Occupy couldn't pull it off. Should we really expect its rebirth, or just more hype and fizzle? And what I think we need to do is find some way to avoid the fiscal cliff, to avoid doing anything that would contract the economy now, and then deal with what's necessary in the long term debt reduction plan as soon as they can, which would presumably be after the election. Catch the apparent contradiction? Clinton expresses concern of the economy going over a cliff and seems to say so with a degree of urgency, but rather than advocate immediate response, he seems to prioritize more extend and pretend. If politicians aren't serious about deficits now, why would they get serious after the election? Clinton seems to advocate a very brief extension of the Bush tax cuts. But only for a matter months, not even for another year. Sounds to me like he's pushing an economic gimmick that might give a pre-election economic pop, but one that would further mask how dire things are right now. Voters need a greater understanding of America's economic crisis before the election, not a gimmick that pushes their enlightenment back past election day. I think we're closer to the cliff than many realize. But vocal tone and body language in this televised political discussion don't give me much to be optimistic about regarding efforts to resolve that country's economic and political crisis. Retailers continue to tighten their just-in-time inventory processes, and increasingly rely on centralized regional warehouses. It's not just in America. AUSTRALIANS' growing reliance on food transported long distances on drum-tight distribution schedules has heightened the risk of food shortages in the event of crises such as floods, bushfires and pandemics, a federal government study has found. American supply chains are susceptible to many of the same natural forces as those in Australia. We should also be increasingly concerned how economic hiccups might disrupt deliveries. If food producers, supermarkets or trucking companies got pinched in even a short-term banking crisis credit crunch, it's possible at least some parts of supply chains might become erratic for at least a spell. It's said the typical American supermarket carries about three days worth of inventory. And I've read recently many American families keep fewer than five days worth of food in their homes. Could you feed your family with what's on hand for a week, or two, or three - or longer - if you had to? If thinking in less severe terms makes this easier to swallow, understand that not everything might go in short supply at once. Remember the Eggo Waffle shortage a couple years back? How about the canned pumpkin shortage of Thanksgiving 2009? It never hurts to take stock of the things you would not want to go without, and then home stock an extra unit or two just in case. You might even save money if you do your stock-ups in quantity when you find your desired items on sale. What can we learn from Estonia today... and the America of 1920-21? Karl Denninger explains at Market-Ticker.org. Back on one of the early Don and Doug shows, we talked about that V-bottom depression of the early '20s. We may go there again on today's program at 1:00 pm EDT. The Euro maybe the European Union may be on their last legs. But all the new solutions being bandied about sound like the old solutions that didn't work. One of the knuckleheads on CNBC even says the U.S. should take the lead and orchestrate a European bailout. We'll recap that insanity and more. Anyone remember the Peter Principle? It seems to be alive and well in politics and government at home and abroad. There's other stuff to talk about too: Things like Wisconsin, Jesse Jackson's plans to march on gun shops (just like he did five years ago), and will Romney veer to the middle now that the nomination's sewn up? What's it all mean for you and me? We'll try to connect some dots Thursday (June 7) at 1:00 pm EDT with Don and Doug on TalkSouthRadio.com. Update: We didn't get to Jesse Jackson or Mitt Romney this show, but we worked a bunch of other stuff in. Second half hour we talked about some of the old family photos I posted on the blog earlier this week, and discussed how community organizing was different in America's good old days than it is now. The June 7 Don and Doug show is now available on the TalkSouthRadio on-demand player. The New York Times reports House Speaker John Boehner has opened talks with the Department of Justice regarding Fast and Furious documents House investigators want but DOJ won't release. The Daily Caller says the Times story isn't true. Whatever the case is, things would likely be a lot more transparent if Speaker Boehner stood behind House investigators and helped give them the subpoena they want to get the records with no strings attached. "The end is not near, it is here and now." "This is all coming to a head faster than anyone anticipates." Is anyone ready for what comes next? On CNBC today, Steve Liesman said it's time the U.S. took the lead in creating and implementing a European rescue plan. We can't fix our own mess, but Europe's going to open its arms and let us restructure its quagmire? That's crazy. Since 2008, all kinds of cash has been pumped into failing entities at home and abroad, but nothing's been fixed. A flood of new IMF (U.S.) cash might push Europe's catastrophe back, but it won't stop it. A big reason for trouble in Europe now is the EU removed age-old economic safeguards. National economies used to act like the bulkheads of a ship, usually containing damage if one economy ruptured. But the EU model eliminated bulkheads or at least rendered them far less efficient. Now trouble in one state quickly flows to another and then another. Liesman's plan may sound good to conventional thinkers, but like all the other bailouts and cash infusions, it's unlikely to fix anything. It might buy some time and push disaster back by six months or even a couple of years, but unless Europe's bulkheads are restored and its nations trim the flood of unsustainable spending, the Titanic will still go down. Does anyone think we'll fare any better having tightly lashed our own ship to its side? The politically correct crowd would likely have a cow if armsmakers made a pitch like this today. "And so safeguard yourself from the growing menace of auto bandits and thieves. "Colt protection, so essential to the home, is even more necessary when traveling highways beyond reach of help." Who's really the out of control? On Politico this morning, Roger Simon declares Bill Clinton is out of control. It seems Mr. Clinton is doing things that detract from the Obama campaign, and it's bugging some Dems. But is Clinton the one that needs to be reigned in? Clinton seems mainstream American compared to Barack Obama. Perhaps Clinton's doing what he is because he understands what Obama really meant when he touted a fundamentally changed America. 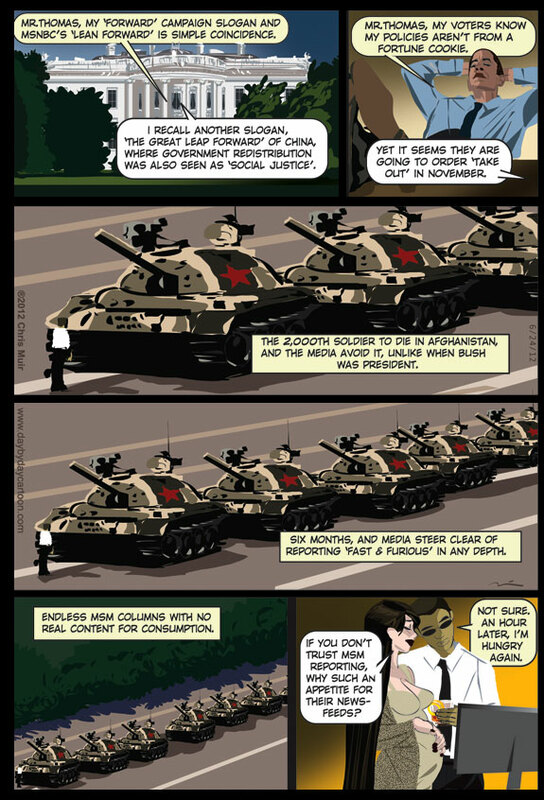 Clinton may be a progressive Democrat, but Obama is a democratic socialist. Or worse. Zimbabwe's Robert Mugabe has been chosen as a leader for tourism by the United Nations' World Tourism Organisation. If the UN has any credibility left, it's slipping away fast. I've noticed what appears to be a trend among people. 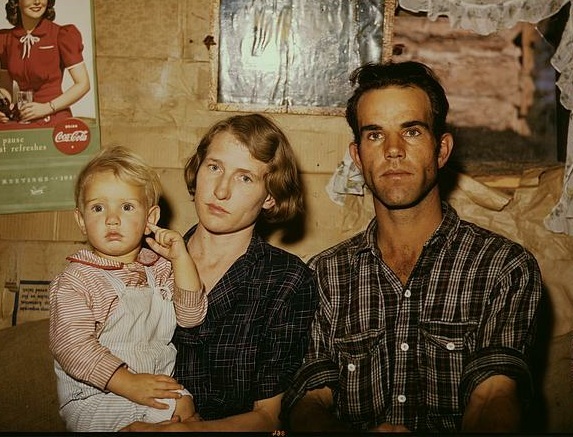 Many who seem to have the greatest awareness about today's precarious times were part of the generation growing up when oral histories of the Great Depression were being passed along as routine back porch conversations years ago. There was a time in America when people spent hours together engaged in simple conversation. No TV. No radio. No iPods or iPads. Just time together at the end of the day or in passing time on a weekend afternoon. I'm glad I grew up in the tail end of an era that had fewer distractions, where family would sit for hours on a back porch swapping simple stories and tall tales about both good times and bad. History runs in cycles just like life. The old folks knew it. They learned it from even older folks they listened to while sitting on a swing, a rocker or lawn chair on a hot summer afternoon while growing up. Family gatherings still happen today, but often not with same frequency or focus. And there are fewer and fewer folks around who can share first hand stories of economic depression or world war. The younger generation is missing out. They tend to think history comes from a book or a class. 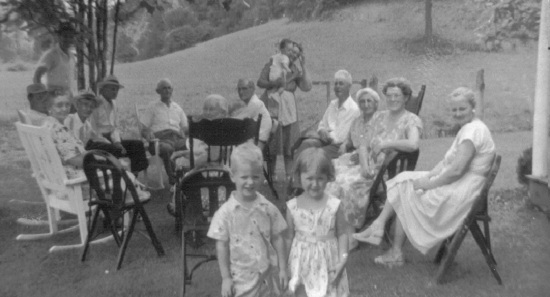 My fascination with history started with family on those backyard afternoons. Saw this at Sovereign Man. It should be obvious the country's going in the wrong direction. But the electorate is as incompetent as the leaders it picks. I hate celebrities who think they can tell me how to think. I won't bother to link to any of the commentaries knocking this Obama ad. Ms Parker's own presentation says all that's necessary. Or so he says. Speaking in Racine, Wisconsin, Jesse Jackson says there are plans to march on gun shops around the country. I wish the audio was better. But I think I heard him specifically mention June 16. No word on any other organisations that might be in this newly announced endeavor. Update: On Twitter, Jackson refers people to the his Rainbow PUSH Coalition site for more information. There's mention of a 20 State Father's Day Action to stop the flow of guns and drugs. No details, however. A Facebook page run by Rainbow PUSH says a shop in Riverdale, Illinois will be targeted, and says bus transportation to the protest location will be provided. Update 2: So, it's a warmed over target. Jackson's led protests at the shop before. In 2007. “Courts, including the Supreme Court, have found similar types of flights to be legal (for example to take aerial photographs of a chemical manufacturing facility) and EPA would use such flights in appropriate instances to protect people and the environment from violations of the Clean Water Act,” the agency said in response to a question about legality. Nebraska's congressional delegation isn't so sure the flights are legal, and it's sent the agency a letter seeking to learn more about the scope and intent of the operations. Senator Mike Johanns said in an interview last week the EPA actions make him uncomfortable. Johanns, a former Secretary of Agriculture Commissioner under President Bush, describes the EPA as an agency with little public trust. For now the EPA is apparently using small planes. No word on whether the agency plans to switch to drones at some point. A man in New Mexico says he was attacked after taking down campaign signs placed on his property without his permission. The Taos News reports the signs featured a judicial candidate. The Taos News didn't report the candidate is a Democrat. Have you seen what George Soros said this weekend? Bubbles are exhilarating as they inflate. But it's only after they pop that it becomes clear they were fed by illusion and fantasy. An open society sounds great until you see that in pursuing it, the more stable frameworks of Western Civilization have been gutted or discarded. When governments and central banks created or allowed entities to become what they deemed too big to fail, they seem to have overlooked an eponymous management law that first became popular in the late '60s. Remember the Peter Principle? Laurence Peter explained "in a hierarchy, every employee tends to rise to his level of incompetence." Perhaps we've now moved to the next step where incompetent politicians and bureaucrats are so firmly entrenched, they've succeeded in replacing society's formerly functioning political and economic infrastructures with new or modified ones better matching their own incompetent perspectives. It hasn't just happened in Europe. American politics and government have wildly taken their own unsustainable paths. And no one seems serious about correcting the imbalances. Instead, when troubles arise, another dose of stimulus or quantitative easing is prescribed or another government entitlement is proposed. When dysfunctional reforms collapse under the burdens created by own faulty designs, many of their champions will still insist the path to prosperity lies in doubling down on the insanity. But it can't go on forever. Amazingly, only a handful of people seem to realize many of today's events are being driven by systemic flaws of relatively recent creation. Many Americans fail to realize how much our standard of living has improved in the past 60 to 90 years. I was flipping through some old family photos this weekend that brought the message home. 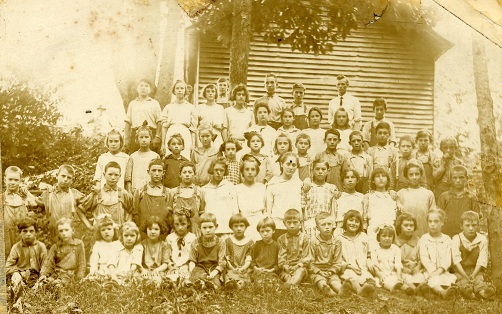 This is what it looked like when my granddad taught at a one room school in rural eastern Kentucky. 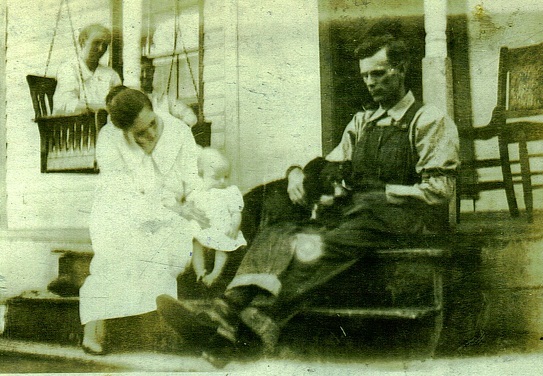 This is what it looked like when granddad farmed his land a little later in life. 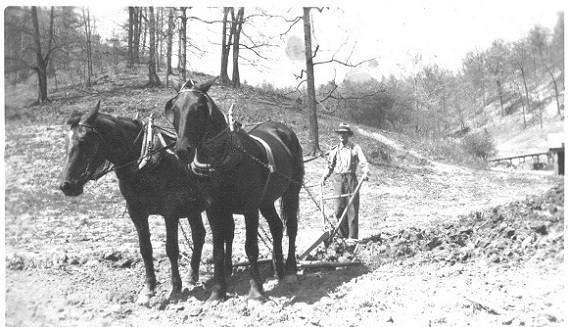 Time was, you felt lucky if you had a motorized vehicle to help run the farm. Many Americans are now living at unsustainable levels of luxury and convenience. A lot of the stuff we take for granted comes our way because our households and/or government are financed by debt, not cash on hand. Government and individuals have had plenty of warning, yet have failed to move to more sustainable models. 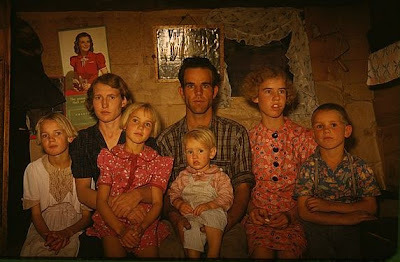 When the next economic crisis comes, how far back will our standard of living be forced to re-set? I'm not saying we'll slide back to the rudimentary levels presented here. But even if not, to our pampered lives, it might feel like it. And some folks might be hit harder than others. Plenty of stuff we take for granted today might go away, or just be priced out of reach. During a traffic stop in Chicago, the Chicago Tribune says cops noticed a three year old girl clutching something you might not expect. After ordering a passenger to step out of a car, an officer noticed the girl in the back seat holding a 9mm handgun, police said. As the officer tried to take the gun away, the girl threw it on the floor but the gun did not discharge, police said. According the report, the car's 19-year-old driver is now facing several firearms charges. The paper twice mentions that though the gun was thrown down, it didn't discharge. You almost get the impression the reporter seems confounded that the gun didn't go off even though no one pulled the trigger. Forget Bush. It's Europe's fault. Europe’s economy that is having an impact worldwide, and it’s starting to cast a shadow on our own as well. At the event, Obama also tried use the European crisis as leverage to pitch that stimulus plan he calls a jobs bill that's been ignored by Democrats and Republicans alike. The economy still isn’t where it needs to be. There are steps that could make a difference right now -- steps that can also serve as a buffer in case the situation in Europe gets any worse. If world economies are about to go south, last thing we need is another round of looting at the Treasury. Especially one intended and timed to deliver the illusion of an economic pop in an election year. Obama also blamed the sluggish economy on high gas prices. Yup. Same guy who blamed Bush for high gas prices in 2008, now blames gas prices for his own failure to perform. Go figure. 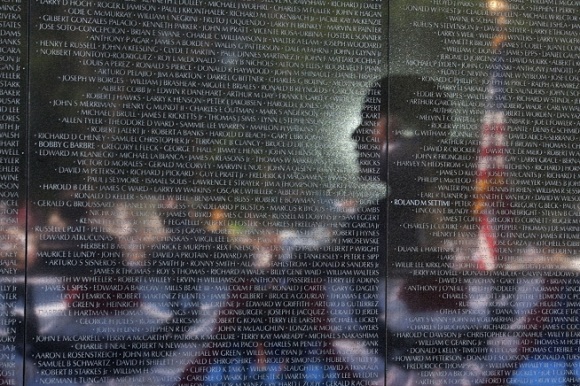 The White House shoots and publishes a photo of President Obama's silhouette surrounded by a halo-like light as it reflects off the Vietnam Veterans Memorial in Washington, DC. Artsy but tasteless? Or would outright sacrilege best describe the shot? 50th Anniversary of the Vietnam War commemoration ceremony in Washington, D.C., May 28, 2012. I'm seeing a lot of chatter. People are worried about flesh eating 'bath salts' zombies. But such instances are rare. Very rare. A less deadly but apparently more widespread phenomenon? Many American parents no longer have the coping skills to get their kids through a birthday party at Chuck E. Cheese. ABC's Nightline had a report earlier this year. How are these people going to react if they ever have to deal with a real disaster or long-term emergency? Imagine having a bunch of Chuck E. Cheese brawlers as neighbors during an economic collapse. Or even a long-term power outage. It was probably one of the History Channel's better treatments of a societal collapse theme in recent years. Now I see someone's posted After Armageddon on YouTube in its entirety. The docudrama starts off with a pandemic scenario, but don't get bogged down with that. As you get farther into the show, it follows a family of three as they deal with situations that would have broader applications. If the show disappears from YouTube, or you simply want a hard-copy of your own, the After Armageddon DVD is available on Amazon. The Corn Refiners Association recently asked the FDA for permission to use "corn sugar" as an alternative name for High Fructose Corn Syrup. The FDA said no. I still drink the regular formula soft drinks. 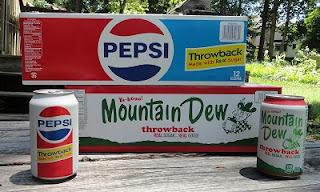 But I increasingly make an effort to buy the Pepsi 'Throwback' varieties that are showing up on supermarket shelves. They don't cost any more than the corn syrup counterparts, but they're made with real sugar. I haven't done a side-by-side comparison, but they seem to taste the same. I also like the Throwback's nostalgic packaging. 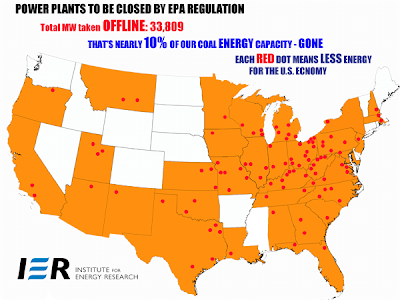 Have you had a look recently at how many power plants the EPA is forcing to shut down? Many of them were previously expected to provide years of future service, and in many cases no replacement for their lost capacity is in the works. Many of the closures are being mandated by the EPA's Mercury and Air Toxics Rule (also known as Utility MACT). And the closures are expected to significantly drive up the cost of electricity. The Utility MACT rule is estimated to cost over $10 billion annually while only providing $500,000 to $6 million in benefits related to mercury. The EPA is unable to quantify or value the health benefits of the other air toxics regulated by Utility MACT. While not only a huge waste of tax payer money, Utility MACT will cause the loss of thousands or even millions of American jobs. According to the National Economic Research Associates, Utility MACT will cost 180,000 to 215,000 jobs by 2015. With other EPA regulations, the economy stands to lose approximately 1.65 million jobs by 2020. In 2008, then-candidate Barack Obama told the San Francisco Chronicle "So if somebody wants to build a coal-fired plant they can. It’s just that it will bankrupt them…” What he didn't say was how many others would go bankrupt or be put out of work by his anti-coal crusade. Nor did many realize his administration would prematurely retire dozens of plants previously expected to serve for years to come. The policy madness and its expected outcome reads like something out of Ayn Rand's Atlas Shrugged. Sen Jim Inhofe (R-OK) has introduced a joint resolution to disapprove and nullify the EPA efforts in play here. A vote on Inhofe's resolution is expected in the Senate later this month. Do you know how your senator plans to vote? Some DeKalb County, Georgia residents are shocked and confused by this year's just released property tax reassessments. DecaturMetro.com gives account of some of the strange goings-on. Dunwoody Patch says one resident reports a 70 percent hike on her Decatur residence. Some neighborhoods are holding their own. But even in a real estate boom, a 70 percent hike sounds nutty. I tend to follow the harder-hit neighborhoods in South DeKalb. And based on what I've observed in the market there over the past year, reassessments are about what I expected. I reviewed a dozen or more reassessments in or near Zip Code 30035 yesterday, and computed an overall drop of 40 percent for the small sample. But this is an area where most buyers seem to be investors who are looking for rock-bottom cash deals. It's not in-town Decatur or Dunwoody. It's kind of scary seeing houses assessed at $150,000 or more just four or five years ago now being assessed at levels closer to $25,000. Can't blame the county for it. That's how far the market's crashed. And we can't even say for sure the bottom's in. And the fact Bob Dylan was a Medal of Freedom recipient this week set this song rolling around in my head. Oh, that the coming changin' was only political. The economic stuff that appears to be coming down the pike makes today's political news seem petty. And it looks like the politicians will continue doing all they can (petty and otherwise) to keep our eyes off the unfolding main event. It was apparently deemed it too political for President Obama to give Poland's Lech Walesa a role in a White House ceremony earlier this week. According to the Wall Street Journal, Poland wanted Walesa to receive the Presidential Medal of Freedom on behalf of the late Jan Karski, but our president nixed the idea. A socialist, however, got a warm welcome at Obama's place. It wasn't too political when Dolores Huerta, an honorary chair of the Democratic Socialists of America, was awarded the Medal of Freedom by Mr. Obama at the White House ceremony. Karski, a Polish resistance organizer in WWII, and Huerta, a labor organizer and political activist, were among this year's thirteen Medal of Freedom recipients. Bob Dylan and John Glenn were among the others. Walesa may have been snubbed by the current resident at 1600 Pennsylvania Avenue, but that wasn't always the case. President George Bush awarded Walesa his own Medal of Freedom at a White House ceremony in 1989. Walesa was also honored with a State Dinner in 1991 after his rise to the Polish presidency. The European economy is in the toilet and China is rolling over. So is the United States. We used our powder and ball; it's gone. The whole post is here. And while you're at it, check out Denninger's parsing of today's unemployment numbers. It's not just Denninger. I posted an outlook from Raoul Pal last night. And here's this morning's take from the Weiss newsletter Money and Markets.